Hey girls! I’m not in school anymore, but “Back To School” is more that actually going back to a classroom…it means trying out a new makeup techniques or products, or playing with a new beauty look. My go to makeup look is a cat-eye with a dark lipstick…so today’s look is out of my comfort zone with shimmering shadow and natural lip color. Today I’m partnering with EcoTools & Burt’s Bees for a fun makeup tutorial that includes some must-have brushes and lip crayons. Both of these lines are available at Walmart, and the low prices make it more of a “must-have”. When it comes to makeup brushes, I get a lot of questions on how many you actually need for the everyday life or if you starting out a makeup kit (if you are a makeup artist…well, that’s another story). So on this post, I decided to narrow it down to 10 . I’m loving these EcoTool brushes, they handcrafted with eco-conscious materials and made from cruelty-free bristles. My dark circles are always out of control…it’s more of a genetic thing than a lack of sleep thing. Reason why I use a “salmon” concealer to neutralize dark blue undertones. I applied the salmon concealer and use the Correcting Concealer Brush to blend. After applying concealer, I used the L’Oreal True Match Foundation in W5 Sand Beige. I’ve used this foundation for a while and I like that it gives me enough coverage without feeling to heavy or cakey. This Foam applicator is great for applying liquid foundation. It is very easy to use and it allows a smooth application that looks very natural. To set the foundation , I used Laura Mercier’s Translucent Powder with the Large Powder Brush- which is very soft and fluffy, you can also use this one to set mineral foundation. I like doing my eyebrows before doing my eyes to make them fuller and more symmetrical . To do so, I use a little kit I got at a local waxing place. I like using it with a small angle brush. This one is part of the 5 piece Starter Kit and even though it’s meant for eyeliner, it works perfectly for the eyebrows too. 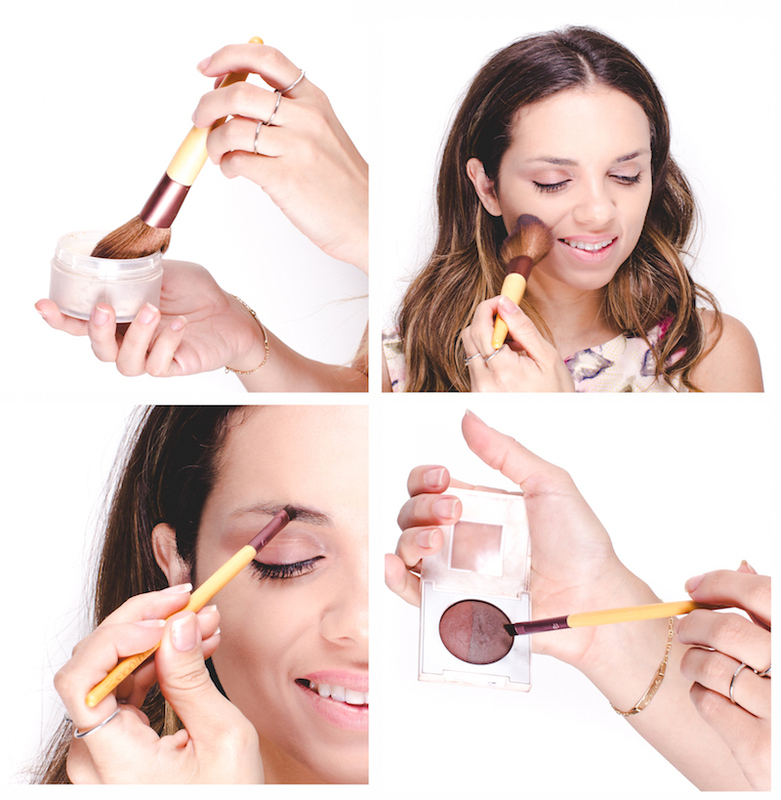 I like wetting the brush a little so the eyebrow shadow becomes a little creamier and the end-result is more natural. a) As a base, I applied “Urban Decay Beware” eyeshadow on my upper eyelid with the Large Eye brush , and on my lower lid with the Smudge brush. This eyeshadow is a medium-brown with a warm undertone and a matte finish. b) Then I applied “Urban Decay Riff eyeshadow” on the inner corner of the eye because it has a little bit of sparkle…so it’s a neutral highlight. I used the Angled Eyeliner brush because its shape made it extremely easy to apply in just one swipe. c) Finally I added the fun “Urban Decay Lounge eyeshadow” on my crease and use the Highlights brush to blend it out. This eyeshadow is duochrome- depending on how the light hits, it looks metallic green or a warm brown. To give my look a little glow, I used “Neutrogena Healthy Skin Custom Blow blush + Bronzer set in Natural Glow 10”. I applied it with the Tapered Brush…which is the perfect size for blush or bronzer. 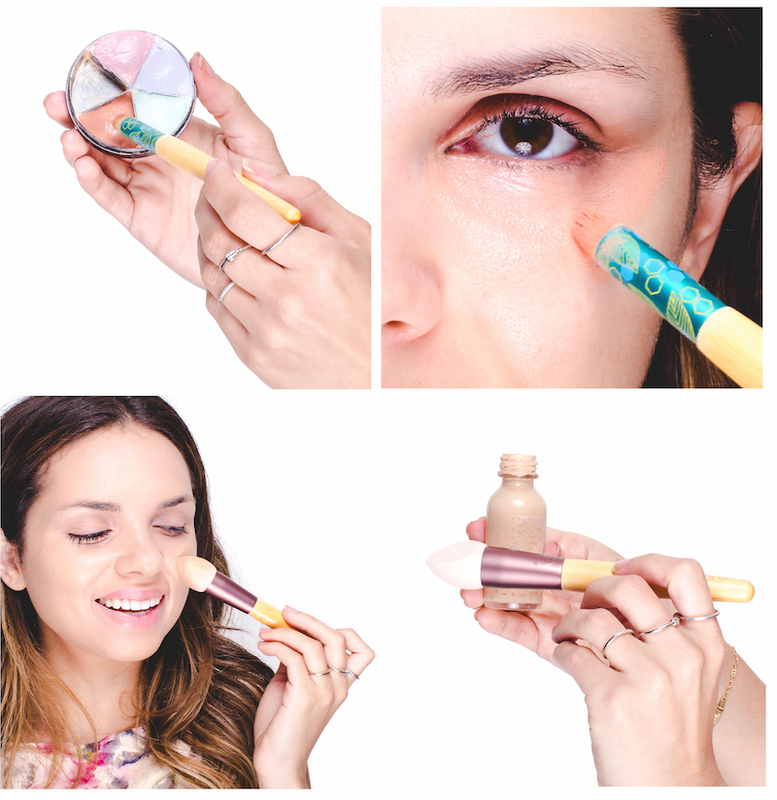 I must try the concealer! I have bad bags and I'm looking for something to get rid of them! great post!